Today we visited Jackie’s garden in Leicestershire, nestled between the village of Groby and Markfield, approx 1 acre in size. Jackie’s garden has been a labour of love for the past 20 years. Shrubs/trees and architectural plants are fringed with perennials and bursts of colour. Slate brook runs through the bottom of the property and a natural pond has been formed of the brook which is fringed with an abundance of water marginals. What’s clever about Jackie’s garden is that you simply can’t tell where the garden begins or ends, it feels like you’ve entered acres, upon acres of parkland because of Martinshaw Woods that surrounds her garden. This lovely large ancient woodland can be traced back to at least the 13th century and perhaps even as far as the Domesday Book (1085-86) where it may have been one of the woods listed under the ownership of the Manor of Groby. Jackie’s garden mimics the woodland – tall trees, a mid layer of plants and lots of ground cover below. 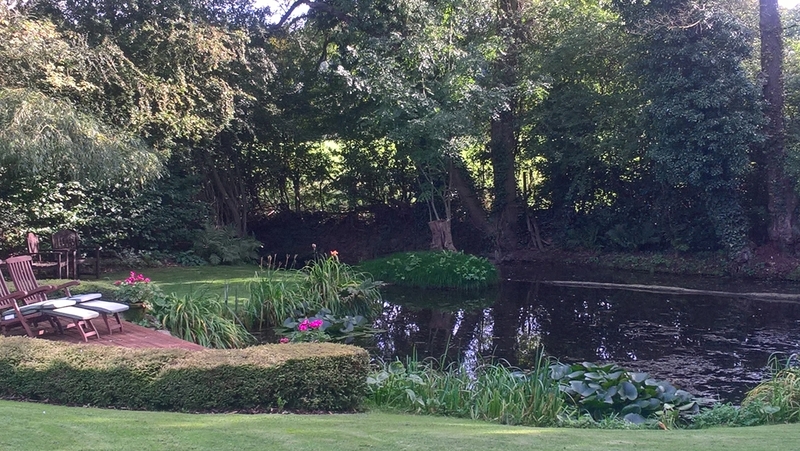 There are also two deep fish ponds built into the hard landscaped areas and numerous undercover rooms/areas to sit under and appreciate the south facing garden and views which are flanked by Martinshaw Woods. 3 large green houses and 2 growing plots from the productive end of the garden – producing home-grown plants and produce all year round. We’d also like to say a big thank you to the other locations that were featured in this episode, including Peter and Angela who let us film their beautiful BBQ Hut in Somerset – supplied and made by Arctic Cabins. They provide an all year-round space that is cosy, sociable, relaxing, atmospheric, fun, warm, unique and versatile. They’re timber structures with a central barbecue, they solve the issue of the Great British weather and give the luxury of spending time with the family and friends in a warm, cosy, exotic Lapland atmosphere just steps from home. Also thank you to Alfresco Landscaping who provided us with a very high-end outdoor kitchen and garden to film in. The garden was designed and constructed by Alfresco Landscaping in Peterborough. Alfresco are a small company who pride themselves in offering a bespoke solution to their client’s needs. With the ability to undertake all the construction activities in house, we have strived to design and build innovative and inspirational gardens for private customers for nearly 15 years. And finally thank you to Paul Newman Landscapes who provided us with a very sleek and sophisticated roof-top terrace garden in South Kensington to film in that he designed. Established in 1993, Paul Newman Landscapes provides a complete landscape gardening service for residential and corporate clients throughout Hertfordshire and London building contemporary gardens for today’s modern lifestyles.